I have a confession to make: I had a serious case of the jam jitters. Don’t get me wrong. I love jam. In fact, I enjoy it almost every morning, spread thickly on sourdough toast or an English muffin. But I had never made jam. You see, I was a can-o-phobe. There are some notable culinary life passages we all face: Cooking that first Thanksgiving turkey. Baking something with yeast for the first time. Shucking that first oyster. Add to that list, jam-making for me. I’d conquered those other rites long ago. It was high time to tackle this one, too. When I won a load of homegrown Meyer lemons from 5 Second Rule’s recent raffle, I wanted to put them to good use. 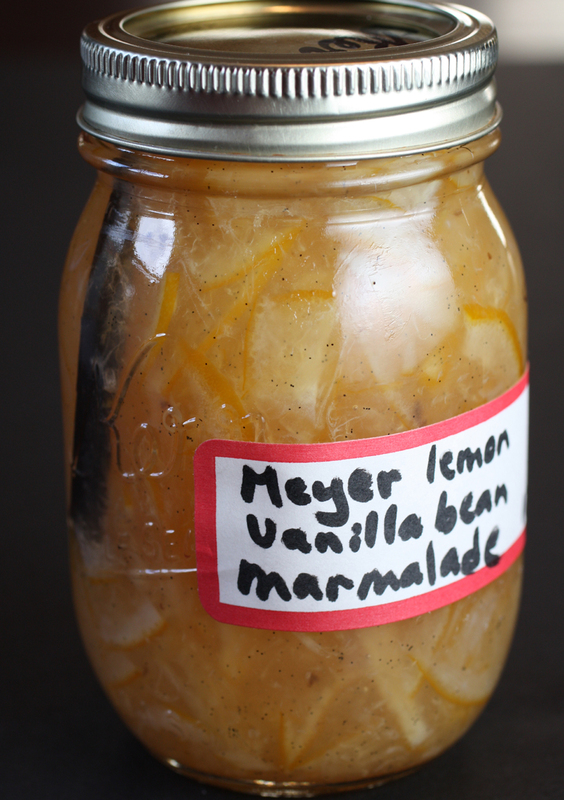 So, Meyer Lemon Marmalade with Vanilla Bean seemed like a most fitting tribute. Jam-making veterans had told me how easy it was to do. They took such pleasure in doing something so old-fashioned and nuturing, and not to mention cost-effective in this horrific economy. For years, I had put off trying my hand at jam. Well, I’d have to buy a water bath canner, for one thing. I’d heard horror stories of jams that didn’t gel. And I worried I’d end up poisoning friends and family members alike if I screwed it up. So, this recipe was perfect for a neophyte like me. It required no water bath canner or any pectin. It consisted of only lemons, sugar, salt, water, and a vanilla bean. I could store the jam in jars in the refrigerator after I’d sterilized them in the dishwasher. It was as easy as can be. I used a mandolin to slice the Meyers thinly, and then removed all the seeds. As the lemons simmered in a big pot on the stove with the other ingredients, the house smelled incredible. Meyer Lemon #5, anyone? The natural, fresh, floral, citrusy fragrance was as intoxicating as any expensive perfume. My only hitch was that I couldn’t get the boiling mixture up to 230 degrees. I came up 10 degrees short, no matter how long I simmered it or at how high of a heat. No matter, the jam set up perfectly once it was refrigerated for a few hours. 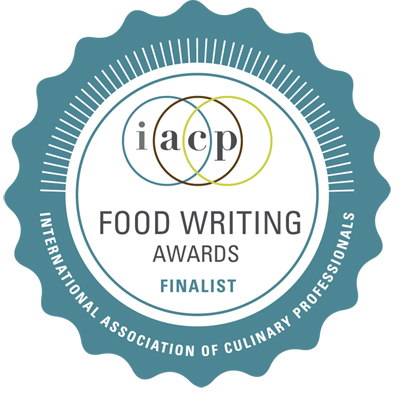 As I stared at my jars, looking for all the world like they were imbued with pure sunshine, I admit that I felt proud. And when I spread my marmalade on toast each morning, I smile at its sweet-tart taste, and its thick, rind-laden, pulpy texture. Working on a large plate to catch juice, cut lemons in half lengthwise, then very thinly crosswise. Discard seeds. Pack enough lemons and any juice to measure 2 1/2 cups. Transfer to a large nonreactive pot. Add 5 cups water; bring to a boil. Reduce heat to medium; simmer 10 minutes. Remove from heat; let stand uncovered overnight. Note: If you have trouble getting the mixture up to 230 degrees, use a trick I learned from cookbook writers Mark Scarbrough and Bruce Weinstein. When boiling the marmalade mixture, add the peels from one apple, wrapped in cheesecloth and tied with twine. The natural pectin from the apple skins will help thicken the marmalade to the perfect consistency even if you can’t get the mixture heated to 230 degrees. Just remove the cheesecloth-wrapped peels before transferring the marmalade to jars. 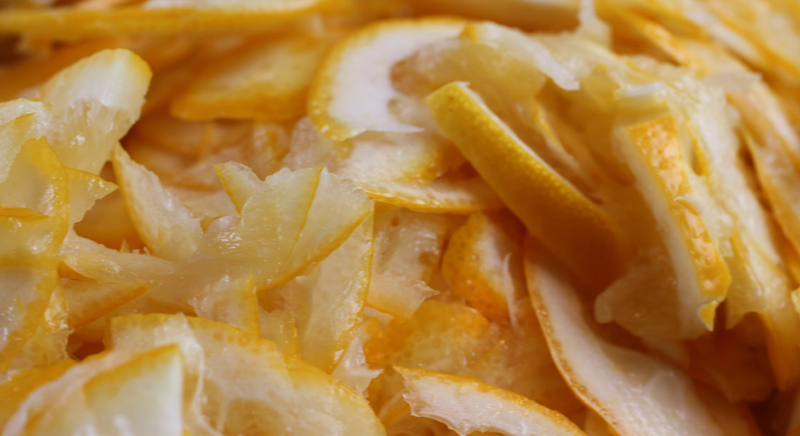 Tomorrow: Meyer Lemons — The Salty; Making Preserved Lemons. Congratulations on your jam success! And meyer lemon is a great ingredient to start with. I have the same concerns about jamming, the whole sterilization issue as well as the whole shelf life issue. So with the refrigerated version, how long can you keep them? Congratulations! I’ve got the same jam jitters. This marmalade looks beautiful. Now that you’ve got the basics down, you’re ready for a water bath. It’s easy and you won’t have to use up so much refrigerator space storing the jam. The old-style granite ware kettles aren’t very expensive either. I’ve done freezer jam, but I admit I have canning fear, too. This is odd, since I was around my mom canning all of the time. I might need to step up to the plate (or the water bath)… but for now— i think I will keep with the refrigerated and the frozen. That sounds great! I bought my first meyer lemons yesterday and I needed to come up with some ideas…and I’m terrified of jamming, too! Thank goodness someone’s making jam in this world. Sometimes, I think Bruce and I are the only ones. I used to laugh when we lived in Manhattan and would be making marmalade one afternoon, telling him I was dead sure we were the only people in Manhattan who were canning at that moment! But Meyer lemons? And from Cheryl’s garden? You’re way, way, way lucky (and a darn good cookie recipe, too). Thanks for giving me this idea. I have a feeling the big old pot is coming out this weekend to make up a batch. Jam jitters? Not me, but I do draw the line by only canning acidic foods like tomato sauce. Acidic foods don’t require pressure — a boiling water bath is sufficient. Way easier and no risk of botulism. Maybe that will be my project this year. We shall have to see….my neighbor across the street is an old lady who cans and she promised she would teach me. I’ll have to go over and talk to her again. No way! A friend just left a whole paper sack of meyer lemons on my kitchen countertop TODAY. I looked at it and thought of salted preserved lemons, but how many jars of salted lemons can I possibly eat? 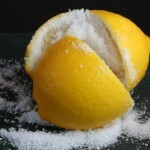 Thanks for the post – I’ll cook up a batch this weekend and, ha ha, give him back his lemons! I just happen to have some vanilla beans, too! BTW, I don’t think jamming is as cost-effective as everyone thinks. We put up 17 batches (that’s 8 or 9 jars per batch) of plum jam this summer (swing on by if you’d like a jar!) and between the cost of the canning jars and the sugar, it’s not cheap to jam! Even though the fruit was free from our tree and a friend’s tree! Wow, okay, now that you’ve provided a recipe and I still have a treeful of lemons (funny how they keep growing back), I’ll make some too and then my Meyer Lemon Vanilla Bean Jam can challenge your Meyer Lemon Vanilla Bean Jam to a duel. Mark, you thought you were the only one making jam? And here I thought I was the only one NOT making jam! Too funny. Whew, I truly am glad I am not the only one out there who suffered from jam-jitters. Rena, did you say plum jam?? Mmm! You’re right about the cost. It does take a lot of sugar, and that’s definitely not cheap. Though, I must say, I have seen some fancy-schmanzy jams in gourmet markets that are pretty pricey, indeed. Nate, uh, duh, yeah, I guess I should calibrate the candy thermometer. Oh well….next time. I have fond memories of my Grandmother canning just about everything. Sitting at the kitchen table watching her when I came home from school she would can vegetables from the garden, wild fruits and berries found around the homestead (we lived with my Grandparents out in the boonies of Oregon for several years). I’ve never attempted to can myself, but it is on a future “to do” list. Bravo to you for conquering this! The chardonnay works great to keep the cupcakes moist and only a slight fruitiness comes through. The extra sugar in the wine also slightly caramelizes the tops of the cupcakes. They’re very unusual, but very good. We got another box of “office supplies” AKA lemons from Cali. Love them but I have to find new recipes! (Lemon chicken, lemon pork, lemon risotto, lemon pasta, lemon cake, lemon bars, lemon sugar cookies…you see where I”m going with this, right? Soon I’ll start juicing them and freezing it in ice cube trays. I have a dehydrating setting on my oven so I can dehydrate the zest which is great. About how many lemons and how many jars do you use? I don’t have space to keep a pressure cooker for traditional water-bath style preserves but this sounds like it would work. Then I have an excuse to use my sourdough english muffin recipe, too. I was thinking of infusing culinary lavender into lemon curd – but then, how much lemon curd can one eat..what an embarassment of riches. But with all this “gold” we should have a prosperous new year, yes?! 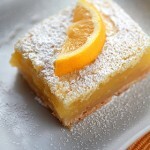 Meyer lemon and vanilla beans, sounds like ecstasy! Please tell me that you have some leftovers for me! Jacki, I think 1 1/2 pounds of Meyer lemons was about six lemons, but of course, it all depends on the size of the lemons. And the recipe does indeed make close to 4 1/2 cups. So for me, it fit into the Mason-type jar you see above, which was a holiday gift for my sister-in-law and brother. And the rest went into another big jar for my own fridge. That jar was similar to the one used in the preserved lemons posting, but short and squatty in shape instead. Count me in as a can-o-phobic! The intellectual side of me says that my fears are unwarranted – canning and preserving are, after all, simple concepts – but the emotional side of me screams “bacteria” and “contamination’ relentlessly. I am encouraged by your post, though. And as my grandmother would say (and demonstrates daily): What doesn’t kill you will make you stronger. Was wondering if you could use Tupperware to store the jam in the fridge and or freezer instead of Mason jars? Lisa: I’ve never tried it with Tupperware. Anyone out there who has done that, who could offer some advice? WOW!! I am a Can-o-phobia also, but I MIGHT be able to pull this off. I just bought the Blue Book of preserving thinking I could teach myself this skill? I actually got very nervous thinking I would poison my friends and family too. There would be nothing more awesome than to eat a thick piece of toast with Jam that I acutally made. Your jam looks so very good. Thanks for posting. That looks ridiculously good. I have been trying to track down meyer lemons at my local grocery stores but haven’t been successful yet. I share your fears about making jam. If even just a tiny bug makes it in the jar, it’s all ruined and potentially dangerous. Scary stuff so I’ll keep it on the queue for now. Mark, you speak the truth. 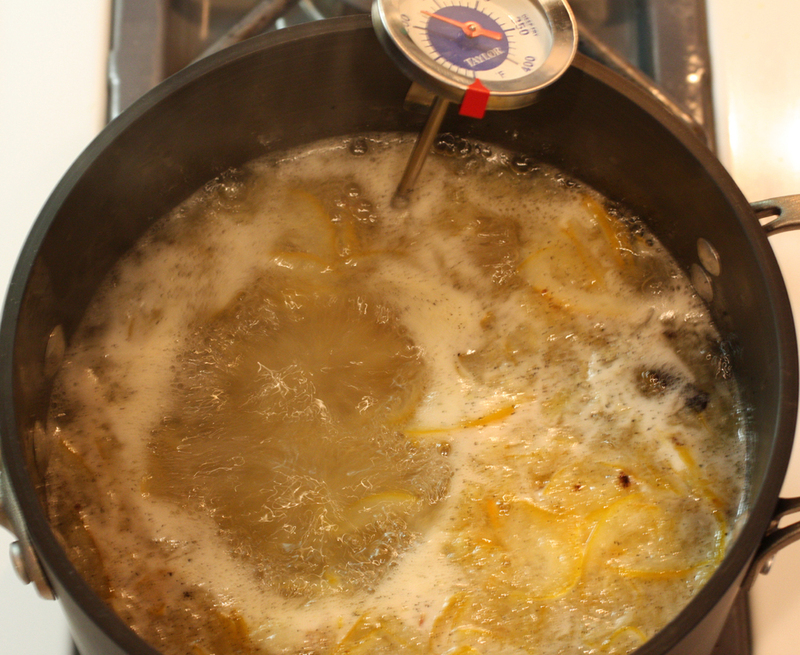 One of the best perks about making the marmalade was the incredible fragrance generated. It was like the world’s best natural air freshener. Pingback: :the wynk: » Blog Archive » Link Day! Oh my gosh, Angela, you are so blessed to have a Meyer lemon tree. And yes, you should be able to freeze the jam just fine. I’m so glad you liked the marmalade. It’s pretty darn tasty, isn’t it? What is a non-reactive pot? I can’t wait to try this! Cyndall, an example of a non-reactive pan would be a stainless-steel one. Basically you won’t to avoid reactive pans of copper, cast-iron or aluminum, which combined with the acid from the lemons, might result in discoloration of your pans and/or a metallic taste in your marmalade. I hope you try the recipe. It really rocks! Just a question. How does this ever set up without any gelatin or anything in it? I am interested in making it but seems like a lot of trouble if it won’t turn out for me. Liz, don’t worry, the marmalade does set up. It’s not cut-with-a-knife thick as some supermarket jams, but it’s plenty thick to spread on toast. 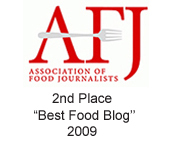 If you want a full-on thick version, check out Mark’s post on RealFoodHasCurves. He uses a nifty trick involving apple peels. This recipe has too much sugar and will not gel if you raise it to 230F You need the same quantity of sugar as fruit, no more eg 3lbs lemons + 3lbs sugar and about 8 cups water. Raise temp to 222F approx. THAT’S ALL! If you need technical details I’ll give them … I’ve been making marmalade of all kinds for years! Richard: Thanks so much for the tips. The jam actually does gel using the original recipe directions. It does not gel to a consistency where it’s as thick as a block of quince paste, but rather to a looser, but still quite thick consistency along the lines of a spoonable fruit conserve. 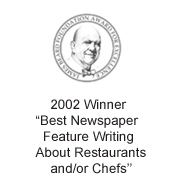 So those who like a more solid consistency can definitely use your directions or those from the RealFoodHasCurves link in my comment right above this one. Carolyn, I also make a killer lemon cheesecake…which most certainly has pucker power…it’s my Mom’s favorite and has lemon curd on the top of the finished cheesecake. I also make a ginger-plum jam – it’s a microwave recipe. Never made regular jam – only freezer (rasp or strawberry). If I can find some Meyer Lemons I can try your recipes. I have no idea what type of lemons I used (foraged them from a neighbor’s tree), but they turned out yummy, regardless. I made it and it was sooo yummy. I wrote about it on my brand new blog. Just picked 35lbs of lemons off our lemon tree. Saw this recipe on Pinterest today and it looks wonderful. Making this jam next weekend! to raise your temp use more sugar! hope your next batch turns out as well as your first! key limes also make a great addition to the Meyer lemons.